Another simple recipe coming your way!! 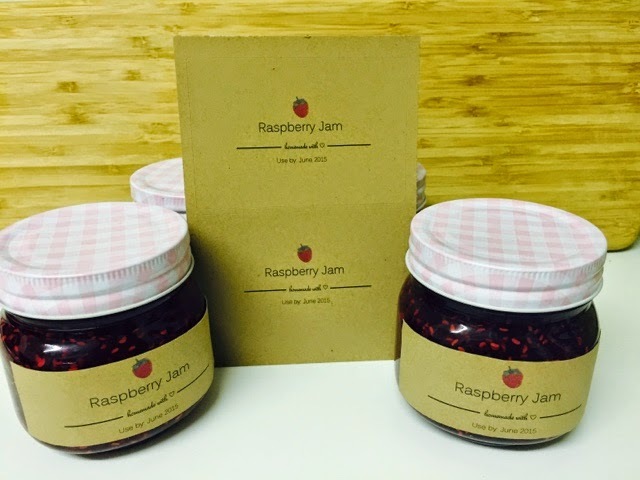 Raspberry Jam - perfect on toast or even to flavour Italian Meringue Buttercream. 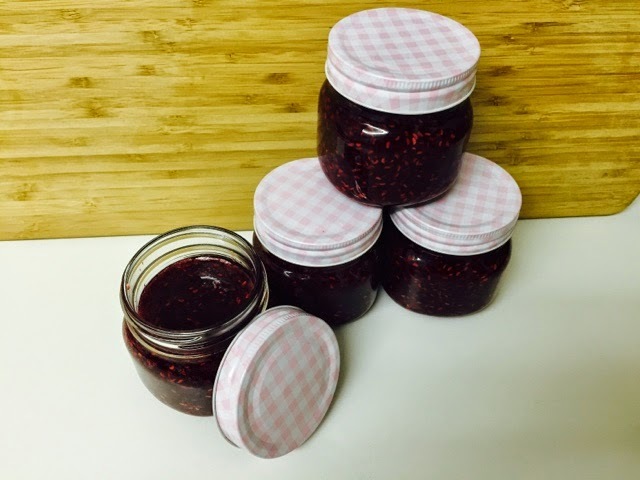 This homemade raspberry jam with only two ingredients couldn't be any easier, all you need is equal amounts of raspberries and sugar. 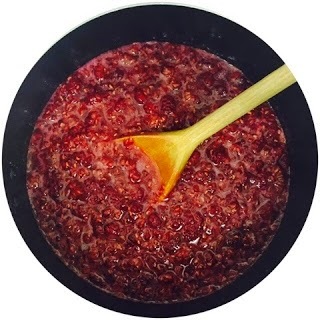 As raspberries already have enough naturally occurring pectin which is the thickening agent, we can just use caster sugar but for other fruits you may need to use jam sugar or add pectin. First sterilise your jars by washing them with hot soapy water and then put them in the oven at 180 degrees to dry or you could pop them in the dish washer. Keep them warm until you are ready to fill with jam and remember to pop a couple of small plates in the freezer - these are for the wrinkle test. 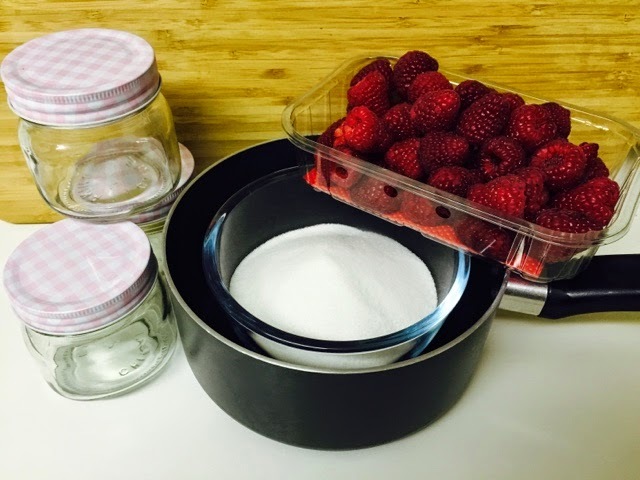 Next weigh out your ingredients, I know that 310g of raspberries with 310g of caster sugar makes enough jam for two of these Clas Ohlson jars. 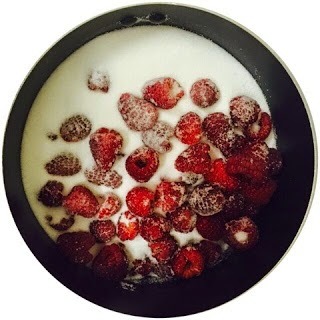 Add the raspberries and sugar to a saucepan on a low heat, mash the raspberries and keep stirring the sugar. Once the sugar has dissolved turn up to a medium heat and you are looking for a rolling boil that you cannot stir down. Then grab one of the plates from the freezer and spoon a small amount of the jam on to the cold plate, push your finger through the jam and it should wrinkle. If so you are ready to fill your jars but if it is still runny put it back on the heat for a little longer and try the wrinkle test again. Pour into the still warm jars and seal the lids tight, store in a dry cupboard and it will keep fresh for 6 months. Once open keep in the fridge. 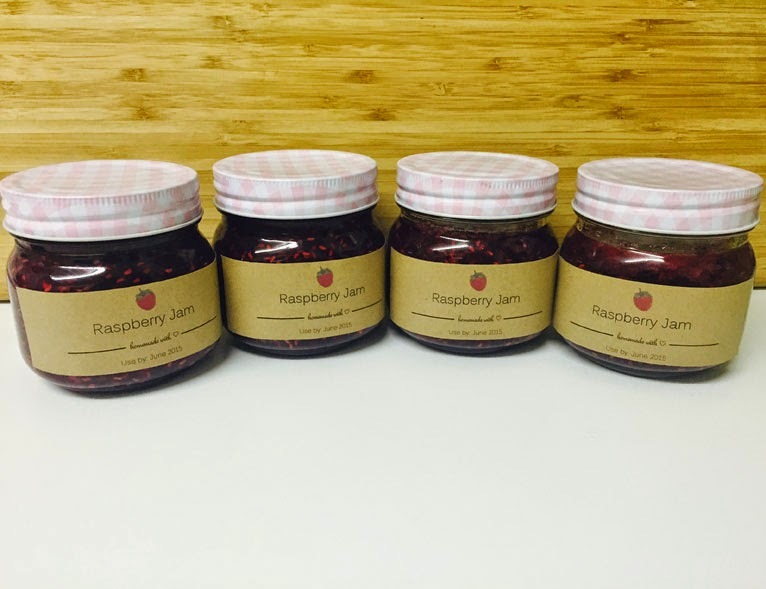 Jam is great as a gift and why not try making your own labels. I picked up these brown labels from whsmith and created my own design using their app.